This is a recent piece that is currently hanging in the League of NH headquarters on main street. 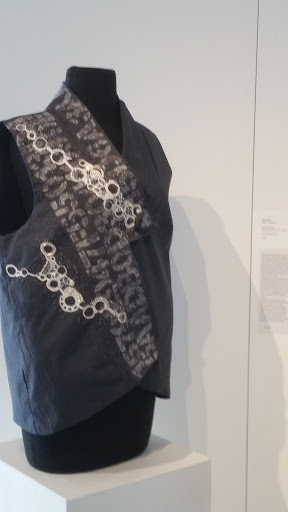 It's another vest that is covered in numbers from a numbers station that moves around the southwest United States. There's about 600 hours of stitching in it, mostly split and back stitch with a layer of needle lace on top with pearls and metallic beads. I'm getting better at these long term pieces,. or at least not bored doing them.